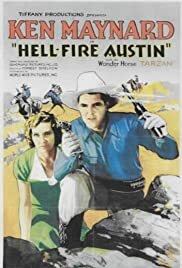 Not the greatest, but entertaining nevertheless For some odd reason, I found 'Hell Fire Austin to be an appealing little Western. Surprising in the fact that a) I've just had it to my keister with westerns, and b) The print I saw of this was extremely bad. I think it has to do with the fact that it doesn't take itself too seriously, and the fun partnering of Ken Maynard and Nat Pendelton. The story itself is a bit confusing, something about Maynard being recruited to race a horse for a outback race, and the efforts by a chief rival of the girl who hired him to stop him from winning the race at all costs. There were some large pieces missing it looked like, so there was some logic gaps. Like why was Maynard fired from his first employer? Mind you, even with the whole story in place, a lot of strange logic errors happen anyways.. How did they get a horse in the 2nd floor of a motel? And why would the police capture Maynard's sidekick when he goes out to do something and demand to know where Maynard is, when all they could have done is just followed him back where he came from? Still, logic issues aside, I ultimately enjoyed this light piece of western fluff.